DaffodilDeciduous perennial from bulb. Narrow, dark green grass-like foliage grows in clumps. Charmi.. Hoop Petticoat DaffocilDeciduous perennial from bulb. Narrow, dark green grass-like foliage grows in..
NemesiaDeciduous perennial. Small, bright green leaves make an attractive mound. Fragrant, pink flow..
NemesiaDeciduous perennial. Small, bright green leaves make an attractive mound. Fragrant, purple fl..
NemesiaDeciduous perennial. Small, bright green leaves make an attractive mound. Fragrant, white flo..
NemesiaDeciduous perennial. Small, bright green leaves make an attractive mound. Fragrant, lavender ..
NemesiaDeciduous perennial. Small medium green leaves stay low and spread slightly, creating a bushy.. Dwarf Cat MintDeciduous perennial. 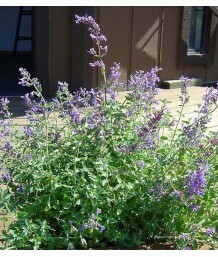 Aromatic minty grey-green leaves grown on upright branches, great..
Cat MintDeciduous perennial. Aromatic minty grey-green leaves grown on upright branches, great for a..
Cat MintDeciduous perennial. Aromatic minty green leaves grown on upright branches, great for adding.. Dwarf Cup FlowerDeciduous perennial. Compact growth. Finely-cut, stiff, green linear leaves. Cup-sha..